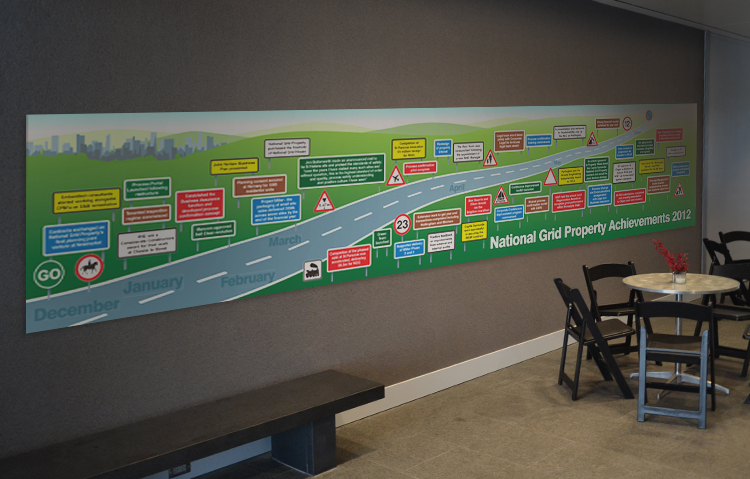 We have been commissioned by the National Grid property division for several years to design, illustrate and produce a large display design for their annual review meeting. The large 5 x 1m display highlights and illustrates key achievements throughout the year. At the clients request, the illustration was to be a road journey, so we created the various signs and illustrative content. Whatever your marketing, graphic design or website design requirement we have the expertise, experience and knowledge you need in a supplier that influences how your business is marketed and perceived by the existing and new customers.